If an investor is given a choice of two 10-year bonds to choose from, one with a 10 percent coupon rate and the other with a 5 percent coupon rate. Assuming the risk of default is the same for the two bonds, the investor will likely choose the one with the higher coupon rate. From a returns perspective, the 10 percent coupon allows the investor to recoup his or her investment in a shorter time frame. The shorter time frame is considered good as it allows the investor to be less exposed to a risk known as the Interest Rate Risk. Interest rate may go up or down at different points in time for different reasons. For example, during a recession, interest rate will be cut to kick-start the economy. When the economy recovers and exhibits behaviour of inflation, the interest rate may increase. It is known that when interest rate goes up, it causes a decrease in the price of a bond. The reverse where interest rate goes down causing an increase in bond price is also true. The risk of the decrease in the price of a bond due to an increase in the interest rate is known as the Interest Rate Risk. One of the factors affecting the Interest Rate Risk is the maturity of a bond. With a longer time frame, the bond is more likely to subject to change in price due to a interest rate change. The other factor affecting the Interest Rate Risk is the Coupon Rate. A higher coupon rate allows the price of the bond to be recovered in a shorter time frame and thus expose an investor to less Interest Rate Risk. We might think that since a decrease in interest rates lead to an increase in Bond Price, it will not in anyway adversely affect a bond's investor. However, a decrease in interest rate will lead to a decrease in future income of the bond investor. For example, the coupon amount received by an investor can only be reinvested in lower yielding bonds. This risk of a decrease in income due to a decrease in interest rates is known as the Reinvestment Rate Risk. In 1938, Federick Macaulay conceived the idea of a measurement call the Duration to measure the Interest Rate Risk. It combines the maturity of a bond and the coupon rate and can be thought of as how long it takes for the price of a bond to be recovered. t - the time period of the cash flow. If the number of years to maturity is 10 then t is 1 to 10. Present Value of Cash Flow at Time t - The present value of the cash flow is discounted using the Yield to Maturity. Bond Market Price - The present value of all cash flows of the bond. One of the interesting side effects of Macaulay Duration is that it can be adjusted to approximate the interest rate sensitivity of a bond. This is the approximation of the percentage change in the price of the bond to the percentage change in yield. The basic assumptions are that the bond is not tied to any Options and changes in yields are small. Modified Duration can be used to approximate the price change of a bond in a linear manner as shown in the formula above. In fact, the price and change in interest rate change relationship is not exactly linear. The relationship is actually curvilinear. 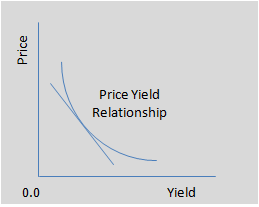 The diagram below shows the approximation using Modified Duration as a straight line and the actual price-interest rate change relationship as a curve. It is important to note that the degree of the "curvature" of the curve is known as the convexity. Bond Convexity is defined formally as the degree to which the duration changes when the yield to maturity changes. It can be used to account for the inaccuracies of the Modified Duration approximation. On top of that, if we assume two bonds will provide the same duration and yield then the bond with the greater convexity will be less affected by interest rate change. This can be easily visualized from the diagram above where the greater the "curvature", the lesser the price drop when interest rate increase. 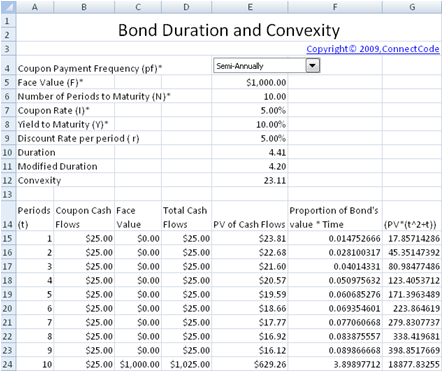 The "Bond Duration" worksheet allows you to calculate the Duration of a bond quickly and easily. The Bond Market Price is calculated as the sum of the values in the column "PV of Cash Flows". Modified Duration - Adjusted Macaulay Duration. Also known as the Modified Duration. It is calculated as Macaulay Duration divided by 1 + yield to maturity. Convexity - The degree to which the duration changes when the yield to maturity changes. The column "(PV*(t^2+t))" is used for calculating the Convexity of the Bond. The formula for calculating bond convexity is shown below. The "Using Modified Bond Duration" worksheet can be used for estimating the price change of a bond when there is a change in Yield. The price change is estimated using the Modified Duration. The Percentage Change in Yield field is an input value for the calculation of the "Percentage Change in the price of the Bond". (-(Modified Duration)/(1+Y)) * (Percentage Change in Yield).